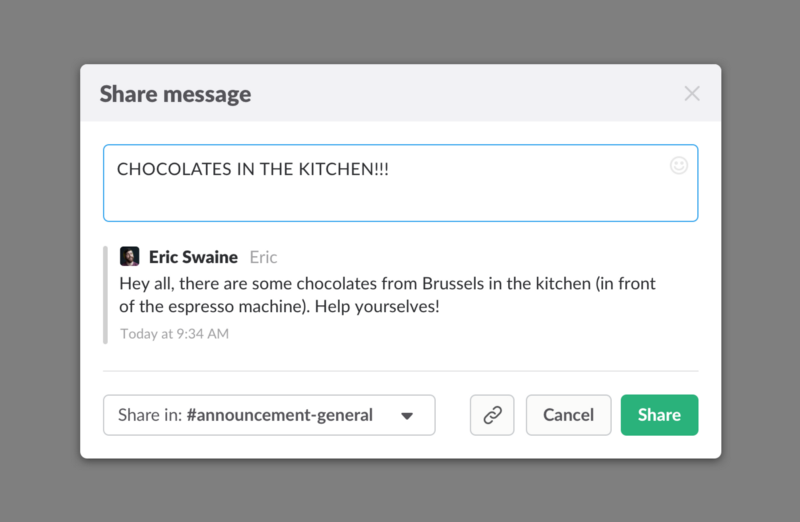 Today we launched the Share button, a new feature that makes it easier to share messages in Slack. No more need to copy a link in one channel and paste it in another. Indeed, your team members will see a copy of the message, alongside your optional comment, without the presence of any fussy URLs. To share a message, simply click the Share button. A window will appear, inviting you to comment on the message you’d like to share, along with a preview of the message itself. It would be tragic for these to go uneaten. 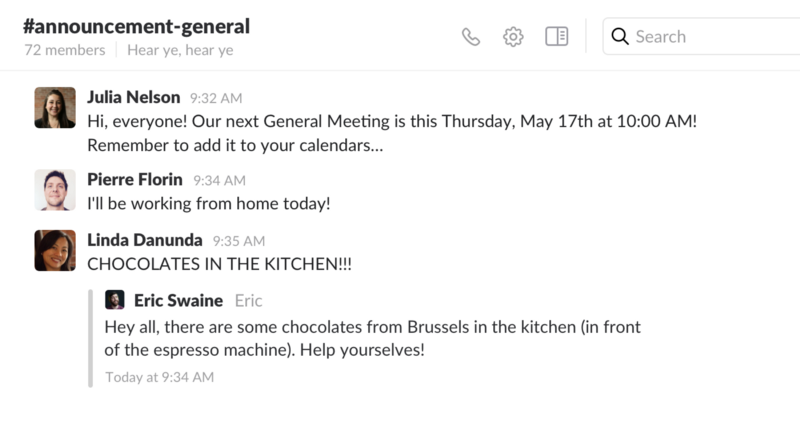 You can share public channel messages anywhere within your Slack team, while private channel messages or DMs can only be shared within those channels themselves. Never fear: the Share button isn’t designed to share your favorite messages from Slack out to the greater web, but rather, to share exclusively within your own team. The Share button comes in handy when you want to refer back to important messages — for example, an announcement of new sales goals, a change in the product roadmap, or news of an employee’s promotion. Someone posts a summary report deep in a project channel — you could share it in a general announcement channel so more people see it. If you have a read-only channel collecting automated reports from integrated apps or custom bots, the Share button is a perfect way to start a discussion in a separate (more conversational) channel. Sometimes conversations start vigorously but end without resolution. Hit the Share button to remind team members of a dangling question or issue. Sharing is also a great way to give credit for people’s original ideas. It’s an easy way to say, “that sounds like an idea Dio proposed a few months ago, here’s his original message”—both acknowledging Dio for his contribution while allowing team members to easily pick up the conversation right where it left off. Dio, and your team members, will have you to thank. Our Help Center article contains additional details of how the Share button works. 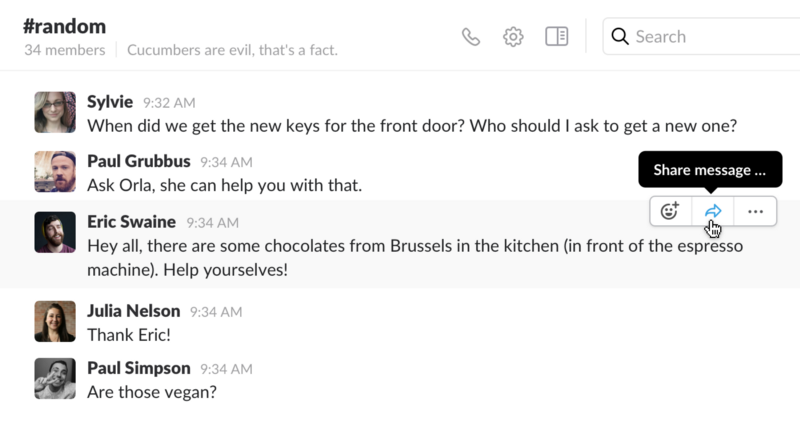 Feel free to send feedback or tweet us at @SlackHQ.